Last week I shared some of the fall decorations around my home. I thought it would be fun this week to share my kitchen. Now please note I do not have a big fancy kitchen like many people and bloggers out there. 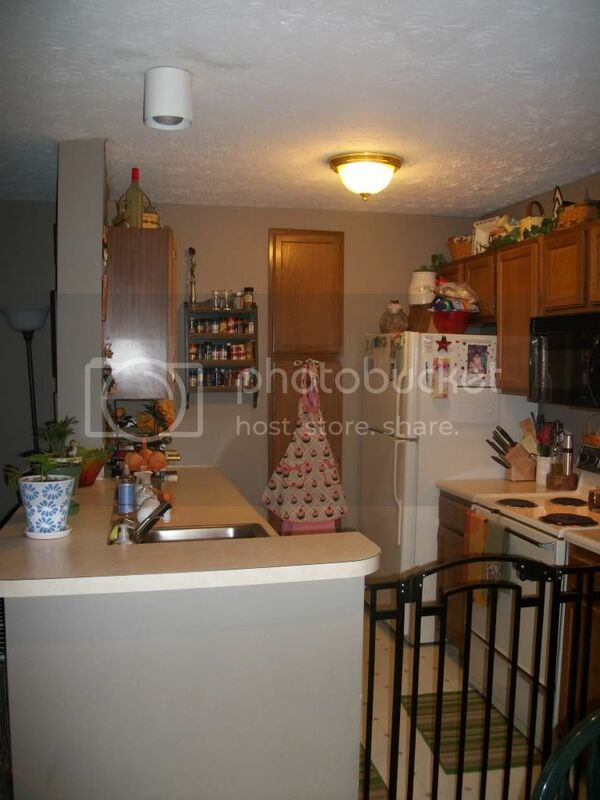 And even though I would love to have some more counter and storage space, it is nice and cozy and gets the job done. And the smaller the kitchen, the smaller the mess to clean up right...well not always! View looking into the kitchen. The gate is to try and keep my pup out of the kitchen. For the most part it works, but sometimes she does break in. 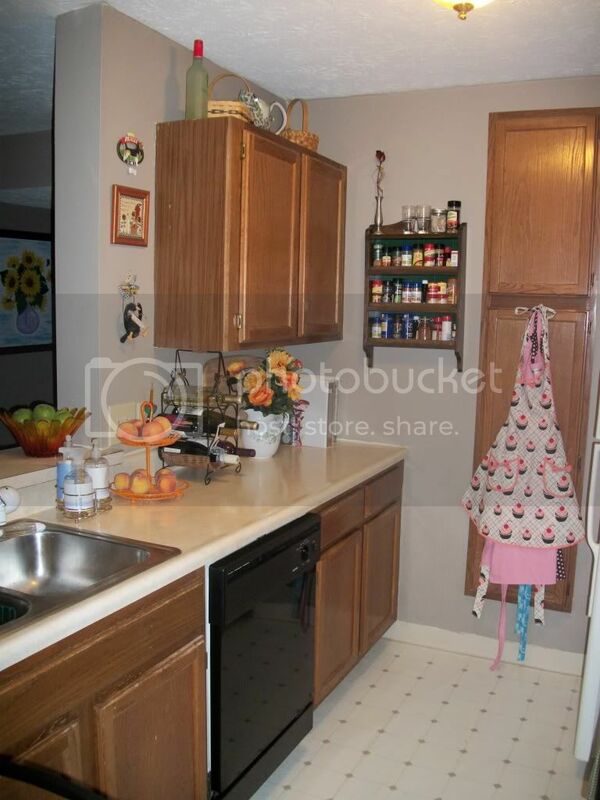 You can also see my apron collection hanging on the pantry door. The left side of the kitchen. In the far corner is where I keep my recipe binders which include all of the recipes I have downloaded off the internet (I'll have to share that project sometime). I also keep my cutting board up against the wall behind that pitcher of flowers. It helps to keep it out of the way, but it is also easily accessible. It's also kind of large and hard to find a place to store it. The cute little fruit/veggie holder I got about 1 1/2 years ago at Crate and Barrel and I love it! Having it out on the counter helps me to eat more healthy instead of grabbing the junk food. And it's so pretty! The soap/counter cleaner set next to the sink I got at Target and it is lavendar scented. Makes washing dishes kind of fun! My grandfather made this spice rack for me back when I had my first apartment (which we will not discuss how long ago that was). I love it so much and finally have it all filled up! Here is the right side of the kitchen, looking in from the living room, over the breakfast bar. All of my kitchen tools are to the left of the stove. I love my knife set which I got at Crate and Barrel last spring. Totally worth the investment to get a good knife set. Thanks for visiting. Hope you enjoyed my little cooking space! Your kitchen looks very similar is size and style to mine! Love your spice rack! 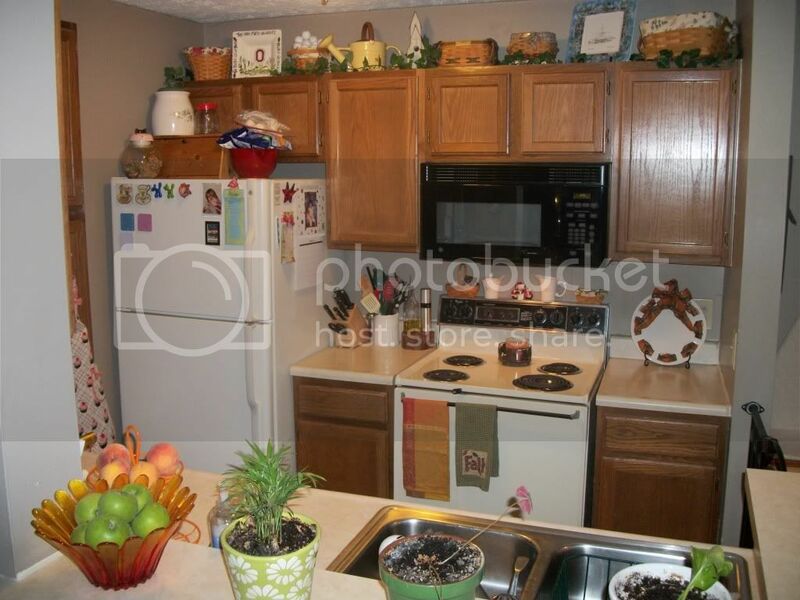 I do like your cozy kitchen, Jen! 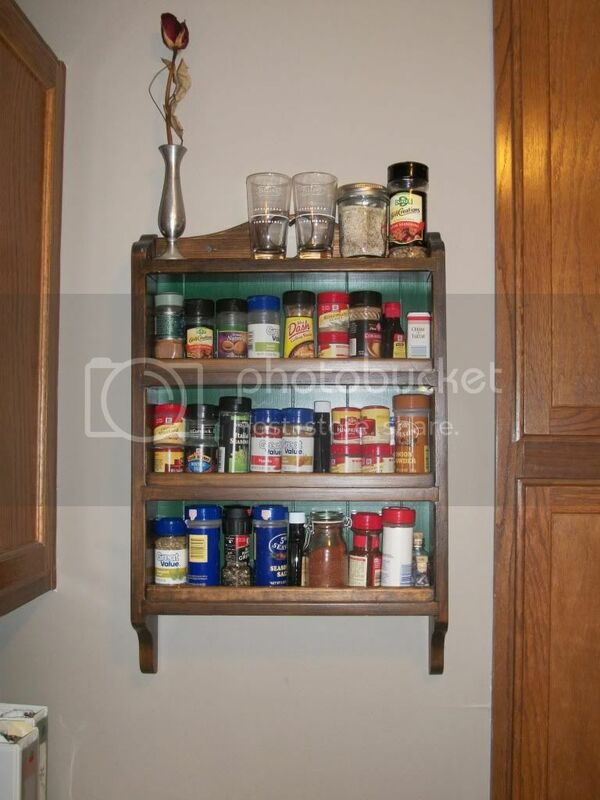 Was it your Grandfather Sayre that made the spice rack? It really is a nice thing to have.